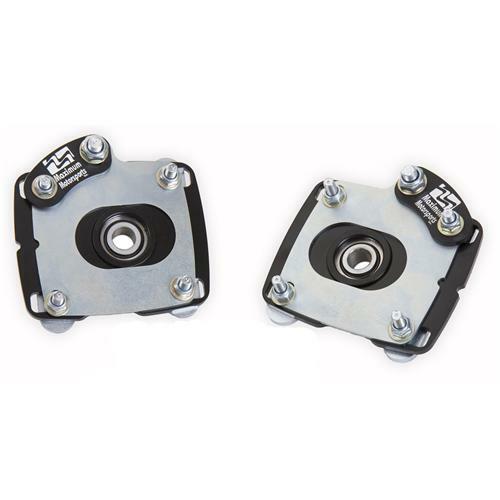 Easily adjust caster & camber in your S197 with Maximum Motorsports 05-10 Mustang caster camber plates. Lowering your 2005-2010 Mustang will cause the top of the front tires to "lean in" towards the center of the car, resulting in rapid and/or uneven tire wear. This excessive negative camber can be easily corrected with the Maximum Motorsports Caster/Camber Plates. Even a Mustang lowered as much as 2.5 inches can still be aligned to factory specifications. 1.6-degree continuous range of camber adjustment provides alignment correction on lowered cars, and is adjustable without affecting caster. 0.7-degree continuous range of caster adjustment provides correction for OEM production tolerances. 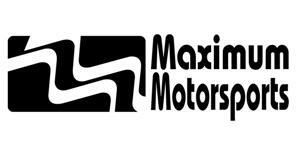 The range of suspension travel can be shifted, allowing for additional bump travel on lowered cars. Teflon® lined spherical bearing eliminates deflection and precisely locates the strut shaft, while still allowing the required articulation. 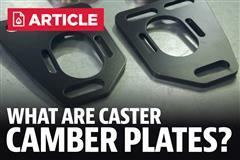 Because these Caster/Camber plates eliminate the factory strut bushing, noise, vibration, & harshness will be increased. High-tech composite thrust bearing transfers the spring load into the strut tower.